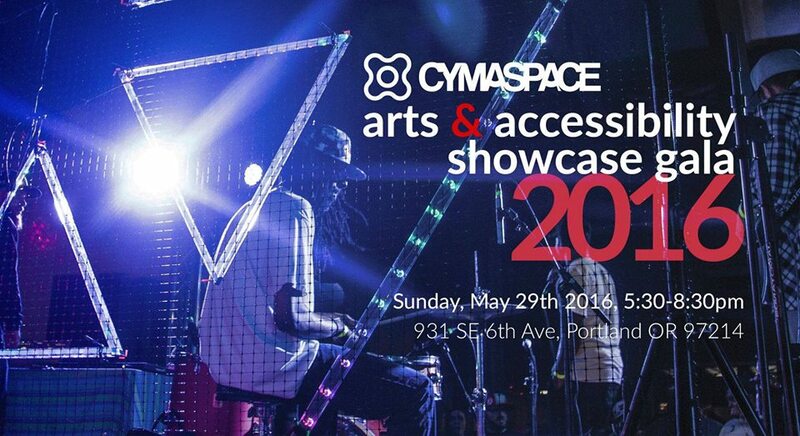 "A celebration of the future of inclusive cultural events brought to you by CymaSpace." To mark the beginning of our third year, CymaSpace is pleased to announce a spectacular showcase of our major accomplishments, in an inaugural fundraiser celebration, and you're invited! Sunday, May 29th 2015 from 5:30 - 8:30pm. We have a very limited number of tickets available, reserve yours early and receive a special discounted price. 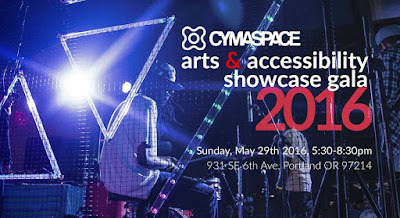 CymaSpace is a Portland, OR based non-profit that focuses on making cultural events inclusive for the Deaf and Hard of Hearing. We develop art and performances that largely feature the synergy of sound, light, and vibration - some of which have been featured on the Jimmy Kimmel Live! show, in the Oregon Museum Science and Industry (OMSI), and the Portland Winter Light Festival. CymaSpace was founded by Myles de Bastion, because as a musician and visual interaction designer who also happens to be Deaf, he experienced first-hand the challenge of participating in a world, that for most part takes for granted the accessibility of sound. CymaSpace serves to create bridges between the Deaf and the Hearing in a positive way that open doors for underserved minorities, changes misconceptions about Deafness and is striving to make a real, socio-economic difference. Through our work, we show that by lowering barriers that prevent equal access to art and culture, everyone benefits. CymaSpace is an entirely volunteer-run organization that consists of a thriving community of engineers, artists and forward-thinking partnering organizations who are pioneering the next generation of accessibility, as it pertains to arts and cultural events. A CymaSpace event is something that needs to be experienced first-hand, all art technology and modern accessibility implementations are developed in-house and cannot be not readily found anywhere else. Whether you are Hearing, Deaf or Hard of Hearing, young or old, all of your senses will be engaged! Guests will be treated not only to complimentary food, drinks, and their very own sound-reactive LED bracelet, but an opportunity to interact with our featured artist works, close up and made personal. Play a sound-reactive LED piano, experience what sound really “feels” and “looks” like, witness an immersive fusion of American Sign Language with performance art, and use hands-on musical vibration to create beautifully marbled Cymatic paintings. These are just some of the activities that will be available to all guests. We hope this invite leaves you intrigued, and you should be, this is what the future of inclusive arts and culture looks (feels and sounds) like and you’re invited! Save the date, this special multi-sensory, multi-disciplinary event will take place on Sunday, May 29th 2015 from 5:30 - 8:30pm at 931 SE 6th Ave, Portland OR 97214.